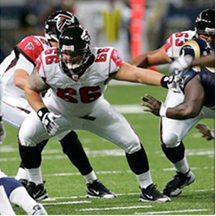 Brett Christopher Romberg (born October 10, 1979) is an American football center for the Atlanta Falcons of the National Football League (NFL). He played college football for the University of Miami and earned All-American honors. He was signed by the Jacksonville Jaguars as an undrafted free agent in 2003, and has also played for the St. Louis Rams.